Gaaaaah! I hate these. I guess they are called "oxalis" and they WILL NOT go away, and they are threatening to take over my yard. Hopefully copious amounts of this and this will help. These hardy plants are quite difficult to get rid of once they have taken root. For some gardeners, however, this is one case where the adage "If you can't beat 'em join 'em" really does have a happy ending. The showy flowers unfurl every morning to reveal their bright yellow trumpets and then wrap themselves back into a closed tube towards evening. Ethan, Lucas and I were walking around our block yesterday and from a distance I thought a house that does nothing with their front yard had put in grass. 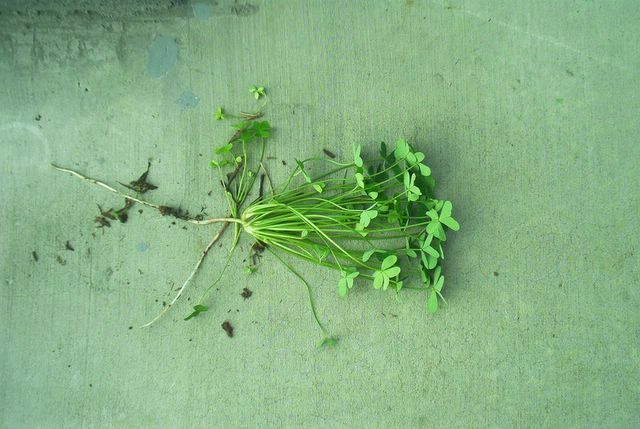 I was wrong it was what you call oxalis. They had even mowed it! Oh, and I think we might have the copyright on "redneck" round about these her parts up in Ideehoo!